Known as the cross-race effect (CRE), psychological research has consistently shown that people are less accurate at identifying faces of another, less familiar race. 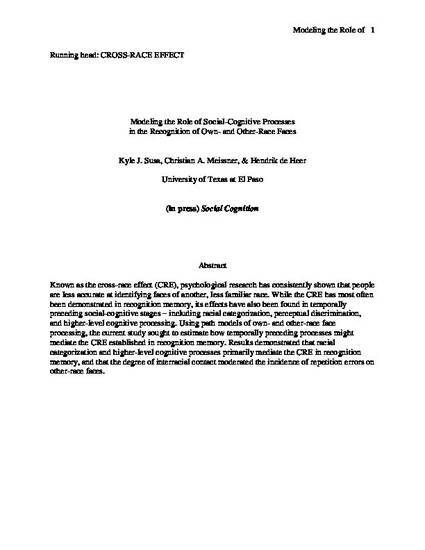 While the CRE has most often been demonstrated in recognition memory, its effects have also been found in temporally preceding social-cognitive stages – including racial categorization, perceptual discrimination, and higher-level cognitive processing. Using path models of own- and other-race face processing, the current study sought to estimate how temporally preceding processes might mediate the CRE established in recognition memory. Results demonstrated that racial categorization and higher-level cognitive processes primarily mediate the CRE in recognition memory, and that the degree of interracial contact moderated the incidence of repetition errors on other-race faces.